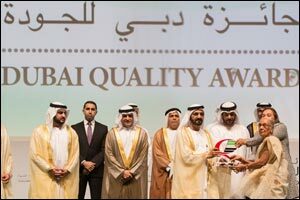 Dubai, UAE, 22 April, 2015: Zulekha Hospitals received the prestigious Dubai Quality Award from H.H. Sheikh Mohammed Bin Rashid Al Maktoum, Vice President and Prime Minister of the UAE and Ruler of Dubai, at the 21st Business Excellence Awards Ceremony. The ceremony was also attended by Their Highnesses Sheikh Maktoum Bin Mohammed Bin Rashid Al Maktoum, Deputy Ruler of Dubai, and Sheikh Ahmed Bin Mohammed Bin Rashid Al Maktoum, Chairman of the Mohammed Bin Rashid Al Maktoum Foundation and President of the International Olympic Committee. The Dubai Quality Award was presented by Sheikh Mohammed to Dr Zulekha Daud, Founder and Managing Director of Zulekha Hospitals, who was accompanied Zanubia Shams, CEO of Zulekha Hospitals, and business associate Adnan Al Talyani. An initiative by the Dubai Department of Economic Development, the Dubai Quality Award promotes organisational excellence in businesses and is a coveted benchmark for organisations who are committed to quality service and business excellence. Part of the Zulekha Healthcare Group, Zulekha Hospitals, Sharjah and Dubai, which is among the forerunners in healthcare in UAE, also won the Dubai Quality Award in 2012. Upon receiving the award during Monday's awards ceremony at the Sheikh Rashid Ballroom, Dubai World Trade Centre, Dr Zulekha Daud said: “It is our honour to receive this recognition from His Highness Sheikh Mohammed once again. The award demonstrates our commitment to providing high quality healthcare to our patients and society at large. Zanubia Shams said: “I pass on my congratulations to the Zulekha team on this prestigious achievement and look back on the journey to winning the award with satisfaction and fulfilment. Taher Shams, President of Zulekha Hospitals, said: “The Dubai Quality Award is the most prestigious recognition of its kind in the region and winning it makes us feel happy and proud. Today the Zulekha Healthcare group includes two multidisciplinary hospitals, four medical centres and three pharmacies in the UAE providing specialised treatments in over 25 disciplines. The Group is also opening a multidisciplinary Hospital in India. Zulekha Hospitals has received extensive recognition for its commitment towards quality care and sustainable business practises, including Joint Commission International Accreditation for patient care and safety, and College of American Pathologists Accreditation for pathology and laboratory medicine standards. It also received the Best sustainable Hospital Award at the Hospital Build & Infrastructure Awards, and the Dubai Chamber of Commerce CSR label award for sustainable business practise.